Defining spaces in your kitchen creates an organized and easy place to live and entertain by creating zones in your kitchen for specific functions. Some examples are Prep, Clean Up, Entertaining, and Drop Zone. Prep Zone can include a place that has a trash, cutting boards, bowls, and knives in the same area so you can prepare dinner in one spot without having to move around the entire kitchen. Clean Up will have your trash, sink, dishwasher, Tupperware, and foils and wraps in the same area so you can clean up after dinner and quickly put away the left overs. Entertaining is where your guests can sit/stand, and a place to keep your beverages that is out of the way of your prep and cooking area. This allows you to be with your guests while cooking, and easily get drinks without having to go into the cooking area. Drop Zone is where your family members come in and has a place for phones, keys, mail, book bags, and laptops. This keeps tables and counters clean of clutter. By having defined spaces in your kitchen, you won’t end up with the overlap that can happen in a kitchen without these zones. While overlap between zones can still happen, having better organization will prevent some of the problems you may have had previously. Your kitchen designer will find solutions to help you plan out all of the different zones you’ll need in your space. See more of the Bristol, RI kitchen featured above in Lisa Zompa’s Kitchen Views portfolio. That long overdue decision has been made, and you are finally going to remodel the kitchen! The anticipation is exciting, not to mention overwhelming. But already the anxiety begins as the questions begin to pop. When do we start, and how do we start? 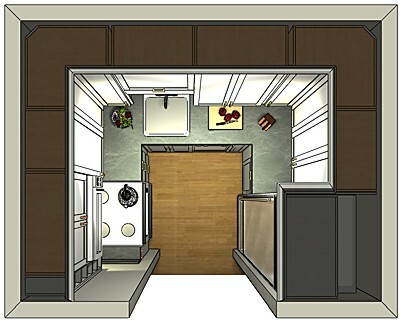 Will my kitchen designer help me to coordinate all that needs to be done with the kitchen remodel? Start by shopping for a good, knowledgeable, talented, and patient designer! Yes, the design process can be lengthy and tedious, and the installation time will be longer than you had anticipated, and certain things will go wrong. You’ve likely heard some horror stories, and they are scary, to be sure. Get connected with a good designer who can help keep the issues to a minimum and under control. Who does countertops? Can I get those through my kitchen showroom? Typically, design showrooms have go to distributors for countertops. They know the best people in the business, so the job will be done well. Will my designer be able to help with that? Countertops are typically a major component of a kitchen remodel, so your designer should be well-versed in them. They can help you to understand the differences between various countertops, such quartz and granite. Here’s a helpful guide on our blog about selecting countertop materials. How do you find a good designer? Where do you find a good designer? Research kitchen websites and information networks (i.e. blogs, etc.) plus check out their reputation online. Then, go into a kitchen showroom in your area and speak with a designer. Remember, there are a lot of talented designers out there. But you want to find someone whom you will actually want to let into your life for awhile. Of course, if you are in the New England region, we hope you will check out Kitchen Views. In addition to talented designers, we have the backing of parent company National Lumber, a family owned and operated building materials business with over 80 years’ experience. The most important part of finding a designer is someone who listens to your ideas and understands your own wants and needs. When it comes to any kind of remodeling, you want a designer who is not only professional, but is a helpful friend to guide you through the various questions and challenges you may have. Once you find the right designer, let your new design friend help you through the process. Follow his or her lead and things will fall into place as they should. Then finally watch as the new kitchen evolves from a drawing or computer generated rendering to the beautiful kitchen your designer promised you! Kitchen Views designers are chosen for their expertise in project management as well as having design talent. As part of National Lumber, a family owned and operated company that has been serving builders and homeowners since 1934, Kitchen Views provides you with a dependable resource for all your remodeling needs, building materials, and services. Please call 1-508-DESIGNS [337-4467] to find a showroom and designer in your area.